Picture from Jen Pahlka, stickers by us at GDS. The other day Jason Fried wrote a blog post called Questions I ask when reviewing a design. It's a good list. Reviewing design work is never easy. And giving constructive feedback is difficult. So having a list of questions to ask is a good idea. I thought it would be helpful to try a pick a few that might be useful to colleagues working on digital services in government. So Russell and I sat down and reduced it to ten questions. 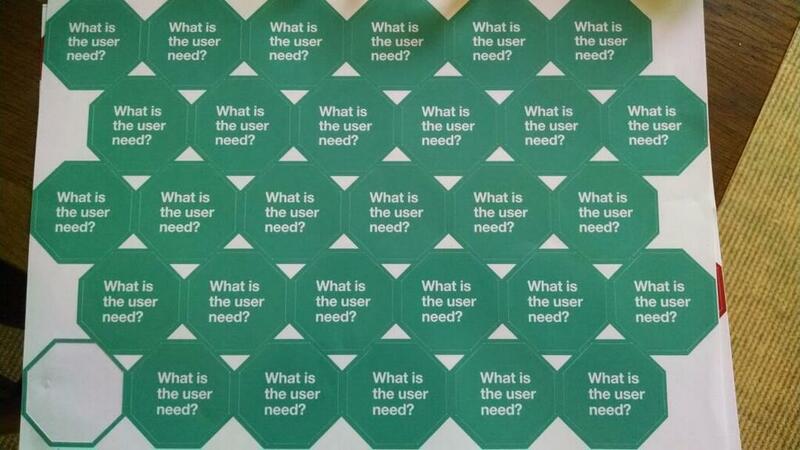 Obviously, the first one we would ask is what is the user need, the rest are taken from Jason's list. 1. What is the user need? 2. Is what it says and what it means the same thing? 4. Who needs to know that? 5. What does someone know now that they didn’t know before? 6. Why is that worth a click? 7. Are we assuming too much? 9. What would happen if we got rid of that? 10. How can we make this more obvious? Very useful. Number 1 is a mantra at our council. However we are still coming across staff who believe that one email/phone call from a resident asking for a document from the 1970s (honest!) creates a user need, and therefore this kind of information is still subject to being published on our website. So one person needs the document ergo it is a user need. Any tips on handling this - over and above governance and process - because it's driving us nuts!